Technicians dressed in clean room suits check the solar panels, which were deployed, on NASA’s Transiting Exoplanet Survey Satellite (TESS) inside the Payload Hazardous Servicing Facility (PHSF) at the agency’s Kennedy Space Center in Florida. Inside the PHSF, the satellite is being processed and prepared for its flight. 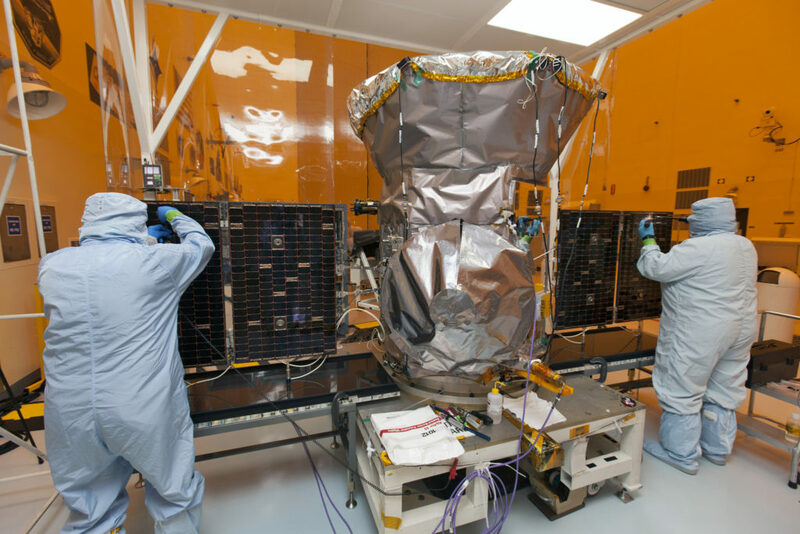 TESS is scheduled to launch April 16, 2018, atop a SpaceX Falcon 9 rocket from Space Launch Complex 40 at Cape Canaveral Air Force Station. The satellite is the next step in NASA’s search for planets outside our solar system, known as exoplanets. TESS is a NASA Astrophysics Explorer mission led and operated by MIT in Cambridge, Massachusetts, and managed by NASA’s Goddard Space Flight Center in Greenbelt, Maryland. Dr. George Ricker of MIT’s Kavli Institute for Astrophysics and Space Research serves as principal investigator for the mission. Additional partners include Orbital ATK, NASA’s Ames Research Center, the Harvard-Smithsonian Center for Astrophysics and the Space Telescope Science Institute. More than a dozen universities, research institutes and observatories worldwide are participants in the mission. NASA’s Launch Services Program is responsible for launch management.